A 45-year-old farmer, Iorngee and his two children (Regina and Tersoo) were crushed to death by a trailer yesterday. The incident occurred on the busy Makurdi -Lafia federal highway near Daudu, in Guma Local Government area of Benue State. Youths within the vicinity, who arrived the scene of the accident, mobilised and set the trailer ablaze. An eyewitness who was at the scene of the accident Tyoyila Unande told The Nation that the family killed are escaped victims of suspected Fulani attacks, who are taking refuge with other family members. Unande said the father and his two children were returning from the farm when the trailer ran over them and the three died on the spot. When The Nation arrived the scene, the trailer was ablaze, while the bodies lay on the ground by the road side. 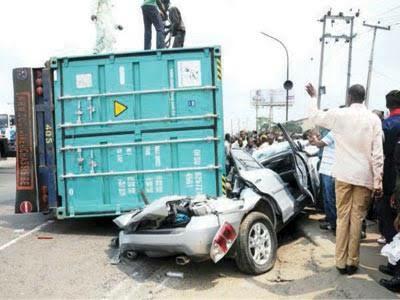 Neither the police nor the Federal Road Safety Corps officials were yet to arrive the scene of the accident as at press time.